In 1979, he tries various disciplines at the Shung Do Kwan in Geneva, and practises Kyudo until 1985. That is when he takes the decision to invest himself into Jodo, discipline in which he finds a quite qualified teacher: Pascal Krieger. Apart from a couple of stops (preparation of exams) covering each one a period of 2 to 3 months, Sergio trains regularly since then under the direction of Pascal Krieger. He is promoted IJF Shoden in 1991, in Penang, Malaysia and obtains his Oku-iri in 1994. In 1997, he receives his Shomokuroku from the hands of Nishioka Sensei. In July 2000, he is promoted IJF Chuden. He then receives his Gomokuroku from Pascal Krieger at the Lignano Gasshuku in Italy in August 2004 and in 2011 he the final teaching certificat 'Menkyo Kaiden' from Pascal Krieger Sensei. Since 1997, Sergio is responsible of a weekly Jodo course at the Shung Do Kwan and continues to assist Pascal Krieger during the Friday courses. The teaching of Budo allows him to draw comparisons with his teaching job in biology. He particularly cherishes the concept of "Sessa Takuma" (the two halves of a stone polishing each other - the analogy of the teacher and the student). 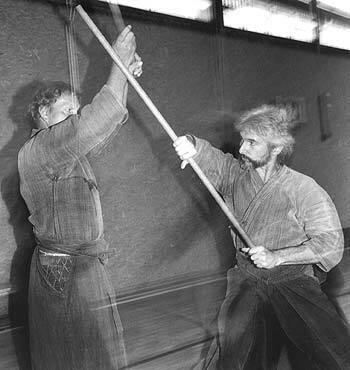 Consequently to the thousands hours of common training with Pascal Krieger, Sergio is technically quite in phase with him and contributes for a great part to the various researches of the techniques of Shinto Muso Ryu. Since the mid 1980s, Sergio practises unofficially Muso Shinden Ryu Iai (Nidan in 2003)..
Sergio Dieci is also an experienced calligrapher and just obtained his 4th dan in Shodo from Pascal Krieger. At work with P. Krieger at the Shung Do Kwan - Geneva.